Starting at: $97,000 – Includes PLC controlled power supply, stand and hopper. Call for multiple unit or dealer pricing. Cutting chamber can be lengthened up to 48 inches. BCA Industries ES1000 shredder is a general purpose high torque, dual shaft shredder, that is durable, easy to maintain, and sets a new industry standard for productivity in a low speed high torque shredder. We set out to design a shredder from the ground up using the strongest and most efficient technologies known. Building a better shredder which provides: power, efficiency, simplicity, durability, weight savings and cost savings over competitive equipment. All designed and built in the USA. Our machines are work horses not show horses. Power is provided by a simple dual stage hydraulic system which is easy to maintain. Hydraulic power is transferred to the shredder shafts by a set of proprietary Disk valve style motors to large double roller chains. Independently powering each shaft. This design provides more control and efficient use of hydraulic power over conventional Piston style motors. Use of chains provides more tooth contact and shock dampening over a Planetary or Cycloid style gearbox. All drive components are off the shelf. No long lead times for drive components, expensive motors or drive gears to replace. Shafts are designed with a simple 6 round key design which holds the knives on the shaft with positive engagement (somewhat like a lug nut on a car). Using this method, knives cannot gall against the shaft or spacers (loosening them over time like conventional hex and double keyed shafts), and there is zero chance for shaft wash out. This feature enables the knives to be removed much easier when replacement is necessary and virtually eliminates the need to ever replace expensive shafts. Knife clamping is accomplished by a proprietary clamping nut inside each bearing protection zone which provides a permanent clamping force 100 times higher than a conventional spanner nut. Once set, there is no re-tightening necessary for the life of the knives on the machine. Knives are heat treated 4140 alloy steel and are hard faced providing superior wear and edge retention. 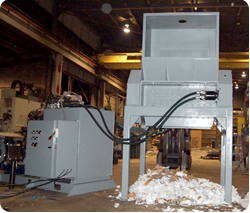 All these improvements create a tough modular shredder head which weighs only 4,500 lbs. This weight enables the operator to swap heads out on a system in less than one hour for maintenance and knife sharpening with a standard 5,000 LB capacity forklift. Shredder head can be maintained offline and not effect production. BCA Industries can provides shredder head maintenance, too service and rebuild your head. Giving your company peace of mind, that your shredder is always good as new with warranty. Shredder heads ship easily by common carrier or LTL load. BCA also provides training for maintenance personal on the proper procedures to maintain equipment on site. With BCA, you'll have lower start-up, operation, and downtime costs. Call us today and let us show you how to shred your costs!